Texas Instruments and SV Tronics recently made the official details of its new Multifunction Tablet, named Blaze Tablet.The new Blaze Tablet is expected to be available for sale by August with an expected price tag of $2,260. The all new Blaze Multifunction Tablet comes equipped with a 10.4-inch touchscreen display with resolution of 1024×768 pixels and is powered with a 1GHz OMAP4430 processor.The tablet houses a 1GB RAM and a 32GB eMMC v4.41 as storage option.The new tablet is based on Blaze development platform which added SW compatibility and allows multiple external camera modules and external Pico DLP projector. 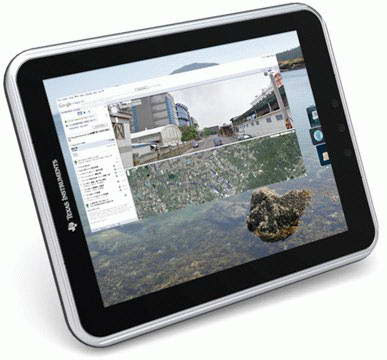 New Blaze Multifunction Tablet Features Wi-Fi 802.11a/b/g/n, Bluetooth, GPS, 1W stereo speakers, four digital microphones, 3-axis accelerometer, 3-axis gyro, Temperature sensor, Ambient light sensor, Proximity sensor, Pressure (barometric) sensor, Digital compass, 3G modem, LTE modem, and pico projector. Blaze tablet also houses a 4100 mAh lithium-ion rechargeable battery and its dimensions are 266×210x29 mm.As told earlier the debut of the Blaze tablet is expected to happen in coming August. Tags:-Blaze, Blaze Multifunction Tablet, Blaze Multifunction Tablet features, Blaze Multifunction Tablet specs, Blaze Multifunction Tablet specifications, Blaze Multifunction Tablet launch, Blaze Multifunction Tablet details, Blaze Multifunction Tablet availability, Blaze Multifunction Tablet launch, Blaze Multifunction Tablet release, Blaze Multifunction Tablet price, Blaze Multifunction Tablet price details, Blaze Multifunction Tablet price tag, Internet tablet, multifunction tablet, SV Tronics, tablet, Texas Instruments.